2014 will be an exciting year for the whole New England region with the addition of the tallest swing ride in the world at Six Flags New England, a brand new wooden roller coaster at Story Land, Bear Creek Campground at Lake Compounce, and the brand new Great Wolf Lodge in Fitchburg, Massachusetts. The Lodge will be a great addition to the areas already stellar collection of amusement and water parks. Great Wolf Lodge New England was officially announced back in September. We didn’t write anything about it in the blog back then because there wasn’t much information to post about. Now we know a little bit more so we figured it was time to post something. The newest Great Wolf Lodge actually isn’t new. It was built in 2008 as part of the CoCo Keys Water Resort chain. The resort has a rocky and short history. In 2011 it went under new management before it was auctioned off for a third time and picked up by Great Wolf Resorts. Great Wolf Resorts had been looking for the opportunity to enter the New England market for a while now so when the opportunity came to purchase the failing CoCo Keys Water Park in Fitchburg, MA they couldn’t pass it up. This is the first time that Great Wolf Resorts is taking an existing indoor water park and retheming it. While it was CoCo Key there was a large expo hall. Great Wolf Lodge New England is going to use this 16,000 square ft. building to their advantage by adding the companies first ever dry play area that will feature a multi-level ropes course and indoor miniature golf. While it isn’t clear from the press release, it is also safe to assume that the brands bowling alley, Ten Paw Alley, will also be under the same roof as the rope course and mini golf. Also exclusive to this new resort is the addition of never-before-seen suite styles—the Majestic KidCabin and the Grizzly Wolf Dens. The number of hotel rooms is being increased from 245 to 406 and the water park is doubling in size to 68,000 square feet. According to the official Great Wolf Lodge Blog the water park will not only include the slide pictured above, Howlin’ Tornado (an indoor/enclosed version of Six Flags New England’s Tornado water slide), but it will also include a never-before-seen water slide to the brand. Sounds exciting! We can think of several possibilities of what this new slide for the brand can be. Great Wolf seems to prefer ProSlide over other water slide manufacturers. Looking at their other properties, it seems like none of them have a slide with a launching capsule. Due to the family nature of their properties, we can’t see them adding one of those. Another possibility would be a family water coaster, similar to Mammoth at Holiday World. Some of the other Great Wolf Lodges have water coasters but they are just standard ones. A family water coaster would be a great addition. Other attractions in the water park are Slap Tail Pond, the facilities wave pool and Fort Mackenzie, the water parks interactive play structure. Sounds exciting! 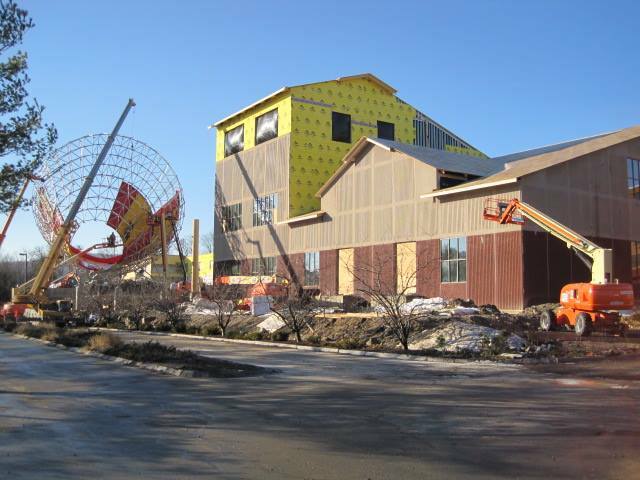 Here is a picture Great Wolf Lodge New England posted on their Facebook page of Howlin’ Tornado being built. Another thing exclusive to Great Wolf Lodge New England is the addition of a dry ride section of the play area. That’s right, there are going to be amusement park rides at Great Wolf Lodge New England. So far all we are hearing is that they will have a frog hopper attraction and a mini train ride with more rides to be announced soon. These rides will be in the same area the new rope course is going into. In addition to everything we already mentioned, there are still a ton of different activities and places to visit when the Lodge opens in the spring. Great Wolf Lodge New England will be the third resort to include the full service restaurant, Lodge Wood Fired Grill, which just debuted last season in Texas and Ohio. Other places to eat include the Bear Paw Sweets & Eats confectionery cafe, Hungry as a Wolf handcrafted pizza and pasta and a Dunkin’ Donuts. Kids will be able to experience fight dragons with MagiQuest and enjoy a spa day with their moms at Scooops Kid Spa. Check out Great Wolf Lodge New England’s website to learn more about those activities plus see what else is coming. If you can’t already tell, we’re very excited that a new indoor water park is coming to New England. We’ll definitely be checking it out sometime this summer. Once we do, we’ll be sure to post a review and trip report to the site.